r e g u l a f i d e i: A Review of Nick Needham's "Justification in the Early Church Fathers"
A Review of Nick Needham's "Justification in the Early Church Fathers"
This is a review of one of the entries in the book "Justification in Perspective" published by Rutherford House, 2006. The entry is entitled "Justification in the Early Church Fathers" by Nick Needham 1. The thesis of the entry, to show how the patristic fathers held a formulation of justification in a forensic sense, "to be declared righteous." He first gives us the target group of fathers that he will be analyzing 2. Why however Needham does not follow the convention of the field of patristics and set the terminus ad quem for the West in the seventh century and the East in the eight, we are only left to wonder 3. 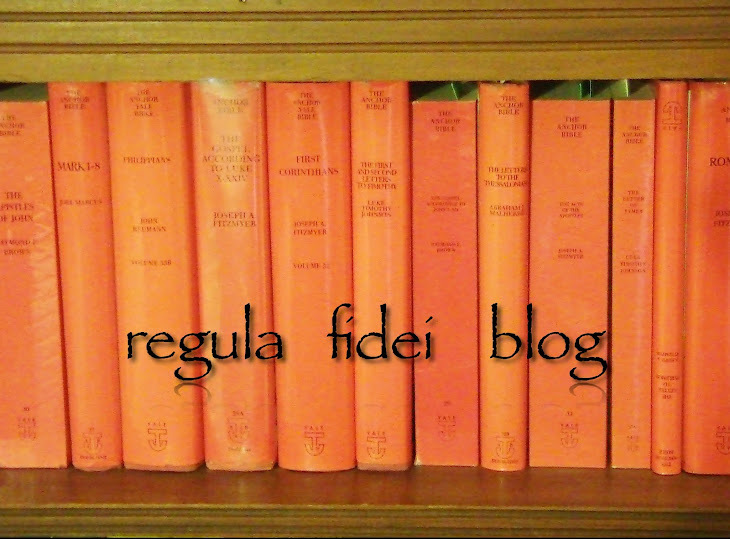 In the next page we are given a glimpse of the perspective of Needham on the regula fidei in general and it is not exactly optimistic in terms of unanymity 4. However, this objection must deal with the reality that the fathers themselves were consolidated concerning their harmony of doctrine 5. Other scholars have come to the exact opposite conclusion concerning the patristic data (one which takes the fathers at their words) 6. Clearly then, the field of patristics is not exempt from theological bias when evaluating the sources. We then hear this statement by Needham, "...it seems clear that there is a very prominent strand of usage in which it (justification) has a basically forensic meaning" 7. In the next few pages in his entry Needham cites various fathers which speak of justification and faith in a symbiotic relationship. All this leads to this bold assertion, "The forensic framework of this justification language is further illustrated by another strand of patristic teaching that employs the concept of imputation - reckoning or crediting something to someone's account...Justin Martyr teaches a bold doctrine of imputed righteousness" 8 (Needham then cites a litany of fathers in support). 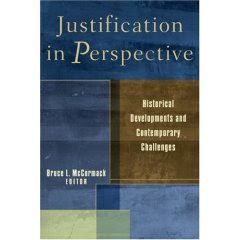 In the section "The Christian Life: Initial Justification" Needham now moves to explain the initial event that causes justification in the minds of the fathers, "There is a strong strand of patristic teaching that ascribes initial justification to faith - either to faith in an unqualified way, or to faith in contrast with works, or even specifically to "faith alone". " 9 Needham finally admits however that in "some of the fathers" justification is a two fold process, mediated by faith and baptism 10. Before we continue on in Needham's treatment of the fathers let us review what he has said thus far. Surely we are given a helpful overview of one aspect of the Catholic fathers but Needham's presentation is potentially misleading. The reader not trained in patristics easily comes away with the distinct idea that in the fathers we see early exponants of later Protestant soteriological schemes. But this is far from the truth and one can wonder why Needham has not painted the full picture? The fathers do not compartmentalize salvation as the later Protestants did, dissecting salvation into an ordo salutis - a specific numbered sequence that occurs in the same fashion everytime. Salvation in the fathers is more of an organic whole and does not follow a set pattern, baptism being the principle vehicle in salvation. "Those are perfect who have the Spirit of God continuing in them, and who have preserved their souls and bodies without blame, holding fast to God, that is, to faith in God, while observing justice in regard to their neighbor" 11. "And again, giving the disciples the power of regenerating in God, He said to them: "Go and teach all nations, and baptize them in the name of the Father, and of the Son, and of the Holy Spirit...renewing them from their old ways into the newness of Christ" 12. "When we are baptized, we are enlightened. Being enlightened, we are adopted as sons. Adopted as sons, we are made perfect. Made perfect, we are become immortal...This work is variously called grace, illumination, perfection, and washing. It is a washing by which we are cleansed of sins...an illumination by which we behold that holy light of salvation" 13. "Since, then, He has renewed us by the forgiveness of sins, He has put a different stamp (baptism) upon us, so that our souls might be like the souls of children, as they would be if He were creating us anew" 14. "But afterwards, when the stain of my past life had been washed away by means of the water of re-birth, a light from above poured itself upon my chastened and now pure heart" 15. "The illuminated take on the features and the image and the manliness of Christ. The likeness of the form of the Word is stamped upon them; and it is produced in them through sure knowledge and faith. Thus, Christ is born spiritually in each one...those who are baptized in Christ become, as it were, other Christs, through a communication of the Spirit" 16. "As dogma, justification through the imputed righteousness of Christ and by faith had not been explicitly taught in the post-apostolic, pre-Luther Church. This claim may come as a surprise to some Protestants, for it has been common to assert that the doctrine of Luther was the recovery of the doctrine taught by Augustine of Hippo or by one or other of the late medieval theologians" 18. In the same learned article Toon goes on to trace this misunderstanding of the fathers by citing the works of G.S Faber (The Primitive Doctrine of Justification 1837) and James Buchanan (The Doctrine of Justification 1867) who are often cited in Protestant polemical works to prove the seeds of Reformational doctrine in the fathers (Needham cites both works in his article freely and with approval to give weight to his argument). But surely Needham would give a balanced picture of this disputed testimony of the nineteenth century by explaining to the reader that these conclusions of Faber and Buchanan have found virtually no consensus among patristic specialists? No such luck. In fact, Needham uses them as authoritative sources to build upon his thesis. Again Toon concludes concerning this material, "A careful study of the quotations supplied by Faber and Buchanan proves only one thing – the early Fathers believed that salvation is by grace." "None other, could restore a corruptible being to incorruption but the Saviour Who in the beginning made everything out of nothing. None other could re-create man according to the image, but He Who is the father's image. None other could make a mortal being immortal, but He Who is life itself, our Lord Jesus Christ" 19. "To justify means to make righteous. The Latin term justificatio is postclassical, so no readily available interpretation existed. Augustine decided that justificari means “to make righteous,” thereby apparently treating -ficari as the unstressed form of facere, as in sanctificatio, vivificatio and glorificatio. He held that the sinner is actually made righteous in justification. He briefly considered and rejected the possibility that “to justify” could mean “to pronounce righteous” (Section 45)" 20. In the final anlysis it can be said that Needham's presentation of justification in the fathers is wrongheaded at best and disingenuous at worse (Needham has gone on to write a three volume (and counting) theological history of Christianity) that we can only hope he has presented the data of the primary sources more faithfully. In treating justification in the fathers, Needham should have prefaced his quotations by the overall teaching of the fathers not to cut and paste what he deemed important to his thesis. 1. Lecturer in church history at Highland Theological College, Dingwall. 2. " ...I am limiting myself to the fathers of the first four centuries. My terminus ad quem among Eastern fathers is John Chrysostom,...and among Western fathers, Jerome," (Justification. 26). Needham does not interact with St. Augustine since he is treated by a whole entry in Justification by David Wright. 3. William Jurgen's, a world wide acknowledged authority in the field of patristics summarizes the consensus view among patristic scholars, "The Patristic age, by common agreement, ends in the West with the death of St. Isidore of Seville in the year 636 A.D., and in the East with the death of St. John Damascene in 749 A.D." (The Faith of the Early Fathers. Vol1. x). 4. A typical Protestant objection, "I am not convinced that these formed a monolith, and doubt whether the "consenus of the fathers" over that period extended much beyond the Apostle's Creed." (Justification. 27). 5. I can supply litany after litany of patristic quotations on the unanymity of doctrine that Needham claims does not exist but a few will suffice. St. Irenaeus can say, "As I said before, the Church, having received this preaching and this faith, although she is disseminated throughout the whole world, yet guarded it, as if she occupied but one house. She likewise believes these things just as if she had but one soul and one and the same heart; and harmoniously she proclaims them and teaches them and hands them down, as if she possessed but one mouth. For, while the languages of the world are diverse, nevertheless, the authority of the tradition is one and the same" (Adversus haereses. 1, 10, 2). Or St. Augustine, "But in regard to those observances which we carefully attend and which the whole world keeps, and which derive not from Scripture but from Tradition, we are given to understand that they are recommended and ordained to be kept, either by the apostles themselves or by plenary (ecumenical) councils, the authority of which is quite vital in the Church" (Ad. Januar). 6. Jurgens can say regarding the patristic testimony, "Not the least of the lessons to be learned from a work of the present kind is how marvellously the Faith is a seemless robe. Cut it hear, tear it there, excise a piece from it anywhere, and the whole of it unravels. " (The Faith of the Early Fathers. V3. ix). 7. (Justification. 28). But did not Needham just claim that there seemed to be no monolithic strands in patristic thought? 9. (Ibid. 38) and again we are given a slew of patristic quotations in support. 10. (Ibid. 41-42). Needham gives only one example of this "two fold justification", St. Basil (On the Holy Spirit. 12, 28). 11. (Adversus haereses. 5, 6, 1). 12. (Ibid. 3, 17, 1). 13. (Paidagogos. 1, 6, 26, 1-2). 14. (Epistula Barnabae. 6, 11). 16. (Convivium decem virginum. 8, 8). 17. I can cite much more of the Catholic fathers on this point but the sampling I give is sufficient to demonstrate my point. 18. Which can be accessed on-line at- http://www.anglicanbooksrevitalized.us/Peter_Toons_Books_Online/Doctrine/justsanct1.htm. 19. (De incarnatione Dei Verbi et contra Arianos. 20). Toon goes on to explain the patristic teaching, "When the teachers of the early Church spoke of deification or divinization, there was no intention of claiming consubstantiality with God, for, in the words of the Creed, only Christ is one in substance with the Father. The idea could rather be summarized something like this: the eternal Logos became flesh and dwelt among us in order to live our life, face. our temptations, die for us and be exalted for us; as the second Adam and thus as representative man, what he did as One who possessed our human nature he actually did for all of us – especially those of the human race who by the Holy Spirit are. in union with him. Salvation is wrought by Christ for us and is achieved in us when his Spirit dwells in our hearts. The biblical basis of such teaching was anchored firmly in the Word-flesh Christology of John’s Gospel...St. Paul’s teaching concerning becoming sons of God by adoption and possessing the Spirit as the seal of sonship (Rom. 8) was also important – even more so perhaps than the famous statement of 2 Peter 1:4 that Christians are “partakers of the divine nature” (RSV)." 20. Toon goes on giving a fair presentation of justification in St. Augustine, "Justification describes the whole Christian life. It is both the initial event and the continuing process throughout life, leading to the perfect righteousness of the eternal kingdom of God. Justification is an event in and through baptism, at which time God forgives sin. Thereafter it is the internal growth of righteousness in the life of the believing sinner. In a sermon on Romans 8 Augustine said: “We have been justified; but this justice increases, as we make advance. And how it increases I will say, and so to say confer with you, that each one of you, already established in this justification, having received to wit the remission of sins by the laver of regeneration (= baptism), having received the Holy Ghost, making advancement from day to day, may see where he is, may go on, advance, and grow, till he be consummated, not so as to come to an end, but to perfection...Justification is by faith and love. While Augustine often declared that justification is by faith, he much preferred to say that justification is by faith and love, or by love alone. This is because he took faith to be the act of believing in the sense of accepting the gospel on the authority of the Church which taught it. Such faith needed love, in terms of love of God and of neighbor, so that it was not merely a dead faith or a faith such as devils possess. Augustine wrote: “By the faith of Jesus Christ – the faith, that is, which Christ has conferred upon us – we believe that from God is given to us, and will be given yet more fully, the life of righteousness.” And, “The man in whom is the faith that works through love (Gal. 5:6) begins to delight in the law of God after the inward man; and that delight is a gift not of the letter but of the Spirit.” Also, “And this is the gift of the Holy Spirit, by which charity is shed abroad in our hearts; that charity alone which is the love of God from a pure heart and a good conscience and a faith unfeigned (1 Tim. 1:5).”16 For Augustine, amor (love) is a neutral term. When directed towards God it becomes charitas (charity). True righteousness is found when amor as charitas is directed to God and neighbor. 21. Toon then goes on to give a presentation of St. Aquinas which needless to say runs counter to Needham's position and is in line with the traditional understanding of the Catholic fathers. Nice work. It's a pretty incredible charge that the early Church taught imputed righteousness. You're right to point out regenerative baptism. Along with Real Presence, this is an important issue which the fathers were unanimous on. I don't see how that can co-exist with "dunghill-theology". It seems almost beyond belief that Protestant scholars are still trying to shove their views down the throats of the Catholic fathers. The usual culprits are "Evangelical" writers who manifestly have an agenda to grind. Sober minded scholars such as the Anglican Peter Toon and a host of others who can clearly read the fathers in context, give us a much more balanced picture of the early church.